Even the most aggressive investors keep some of their money in capital preservation funds. Depending on your tolerance for risk, your personal circumstances, and your best guess for what the future holds, a little of your money or most of it could be in capital preservation funds. These choices are not going to make you rich fast, but they're not going to make you poor overnight either. These choices get you local branch offices that you can walk into if you need to, and you don't have to worry about getting robbed of your spare cash. Under ordinary market conditions, you also would be earning some interest income on your capital. The world of extremely low interest rates on savings that began after the 2008 crash and continued into 2018 was a historical anomaly that is not likely to last forever. The "FDIC-insured" part is critical. As of 2018, it keeps a deposit of up to $250,000 fully insured by the federal government in case of the banking institution's default. 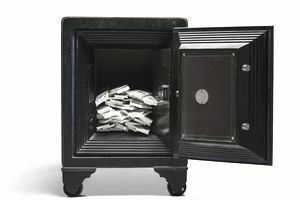 Alternatively, you could keep actual currency stuffed in an envelope or locked in a safe deposit box, but that includes risk of loss or theft. Short-term United States Treasury bills maturing in 90 to 180 days. These are held directly at the U.S. Treasury through a TreasuryDirect account. FDIC-insured certificates of deposit maturing in 90 to 180 days. As with checking and savings accounts, the key factor is that your principal investment is backed by the guarantee of the U.S. government, either directly or through the Federal Deposit Insurance Corporation. If another credit crisis like the one in 2008 hits, you want to emerge with your cash intact, even if your bank fails. If you prefer to bank at a credit union, look for backing by the National Credit Union Association (NCUA). That's the credit union version of the FDIC. In this case, your options get much broader as you can incorporate fixed income securities into your potential asset mix. Keep in mind that savings accounts and Treasury bills can also qualify for this longer-term category. For example, you can get FDIC-insured certificates of deposit that mature in five years, yielding a slightly higher rate of interest while maintaining that safety guarantee. The greatest risks in this category are going to include interest rate sensitivity, credit risk from the financial health of the bond issuer, and changes to your forecast of when you might need the funds. If you choose a long term for the bond, you risk losing potential profits if interest rates rise. If you choose a short term, you're getting less interest than is available at that moment in longer-term choices. In all cases, you generally want to avoid foreign bonds or foreign-currency-denominated instruments. They are not backed by the U.S. government. You'll also want to keep a close eye on expenses and taxes. If you are in the top tax bracket, for example, the tax-free status of most municipal bonds is very likely going to result in more net cash in your pocket than a higher-yielding corporate bond. You need to break out a calculator and figure your taxable equivalent yield. Joshua Kennan is managing director of a global asset management company. The Balance does not provide tax, investment, or financial services and advice. The information is being presented without consideration of the investment objectives, risk tolerance, or financial circumstances of any specific investor and might not be suitable for all investors. Past performance is not indicative of future results. Investing involves risk, including the possible loss of principal.